@LeslieMac & Ricky from @AUADOTORG are joined by Ferguson livestreamer & St. Louis native Bassem Masri to discuss the #JerameReid shooting video, SOTU, OK #HoodieBanBill, ReclaimMLK in STL & Philly, MSM & the movement, community apathy & deliberate distraction. Plus organization spotlight on Million Hoodie Movement for Justice. In Part 2 of this episode hosts @LeslieMac & Ricky L Hinds II from @AUADOTORG are joined by @leeavallen from CAPV to #SelmaShock, political power in the movement, the nuance in connecting the events depicted in Selma with the current #BlackLivesMatter movement. In Part 1 of this episode hosts @LeslieMac & Ricky L Hinds II from @AUADOTORG are joined by Becca and Leea Allen from CAPV to discuss Pittsburgh Police Chief awesomeness, #blacklivesmatter as word of the year and how to be safe while protesting or participating in actions in the movement. fergusonresponse.tumblr.com – Find Your City. Add Your City. Hosts @LeslieMac & Ricky L Hinds II from @AUADOTORG are joined by Davie Celeste to discuss The New Years Revolution Pledge, Things we want left in 2014 for the movement, Analysis of proposed solutions to police violence, Child/Teen roles in the struggle, Arts & artists in the movement. 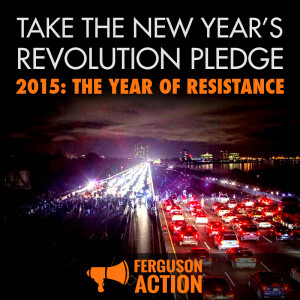 fergusonresponse.tumblr.com for actions – Find Your City. Add Your City.